Thorny pandanus used, and dragged (rubbed) to the opponent's body without wearing top clothes. 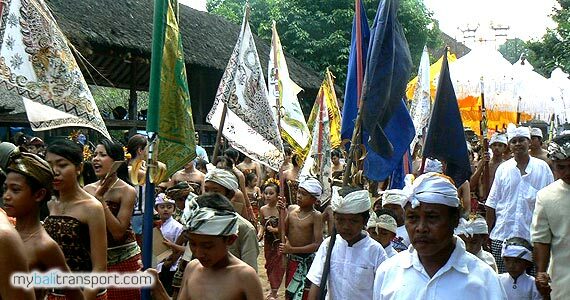 Tradition handed since long time ago called Perang Pandan (Pandanus War) or Mekare kare ceremony or Geret Pandan, only in the village of Tenganan, in the Sasih Kalima (the fifth month on the Balinese calendar) which is part of the ceremony 'Sasih Worship' is the largest religious ceremony in the village of Tenganan. The men shirtless, will fight one on one with thorny pandanus, tied in their hands. 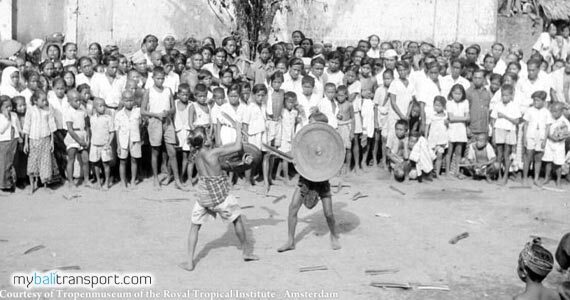 While dance, they compete and rubbed the back of the opponent with the thorny pandanus. His right hand holds the pandanus, while their left hand holds a shield made of rattan. The venue of this event is in front of Bale Patemu (the meeting hall in the village yard). 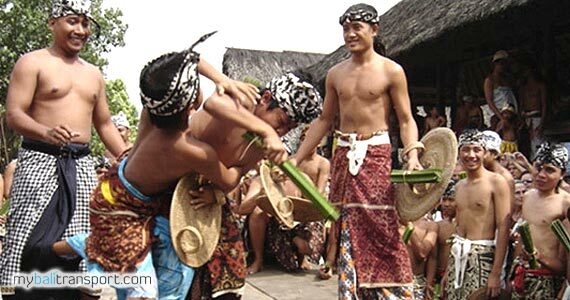 The timing of the usually begins at 2 pm where all citizens using custom Tenganan clothing (with cloth Pegringsingan weaving) and shirtless. This tradition begins with a ritual surrounding the village to seek refuge and safety for the success of this event is held. Games similar to this Boxing sport (with the referee as the leader of the game), conducted without resentment, unwilling, and even with a cheerful smile of excitement. 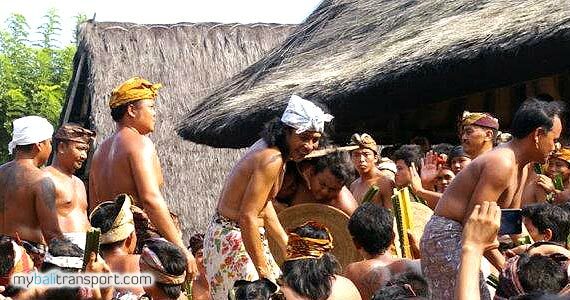 This tradition is part of the worship ritual of Tenganan village communities to Lord Indra (god of war) was honored with blood coming out of their bodies. Accompanied by Selonding, witnessed by Tenganan girl who has been anointed, and the whole villager of Tenganan. The match lasted 3 hours, in two days. The match will end after one of the participants have given up or thats enough by the referee. The body is scratched by the sharpen pandanus and blood running out, be treated with grated turmeric and coconut oil, special formula to treat wounds and remove thorns from body. At the end of Pandan War tradition is to having Eat Together called 'Megibung'. They eating food in a frying pan and sit all together. This is done by all the participants and the whole villager of Tenganan. Visible to see the atmosphere of togetherness and happiness in this village. Tenganan Village is located in Karangasem, Bali. To reach this village, can be reached by a 1.5 hour drive from the city of Denpasar. Driving towards Bypass Ida Bagus Mantra, to Candi Dasa. The village is surrounded by green hills.